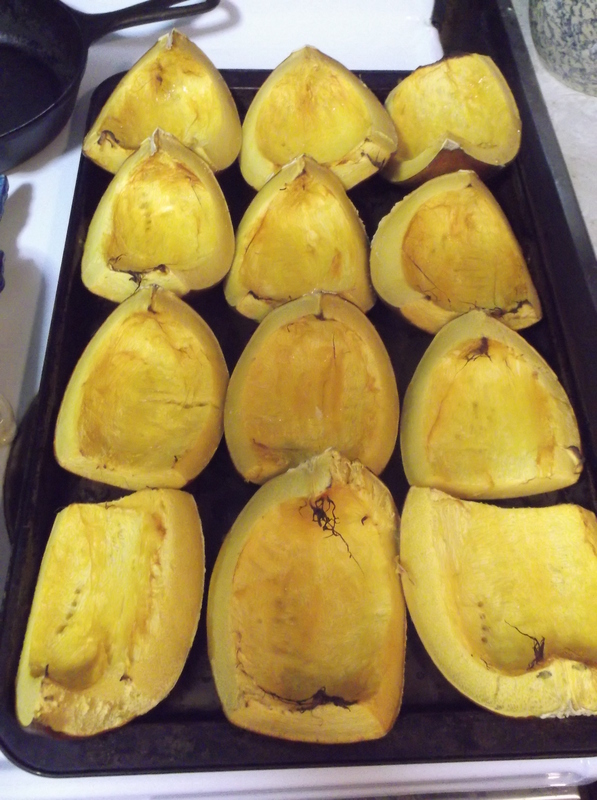 After cleaning the seeds out of the pumpkins, we, of course, cooked and ate them! 😀 There are loads of wonderful recipes to try on the internet. 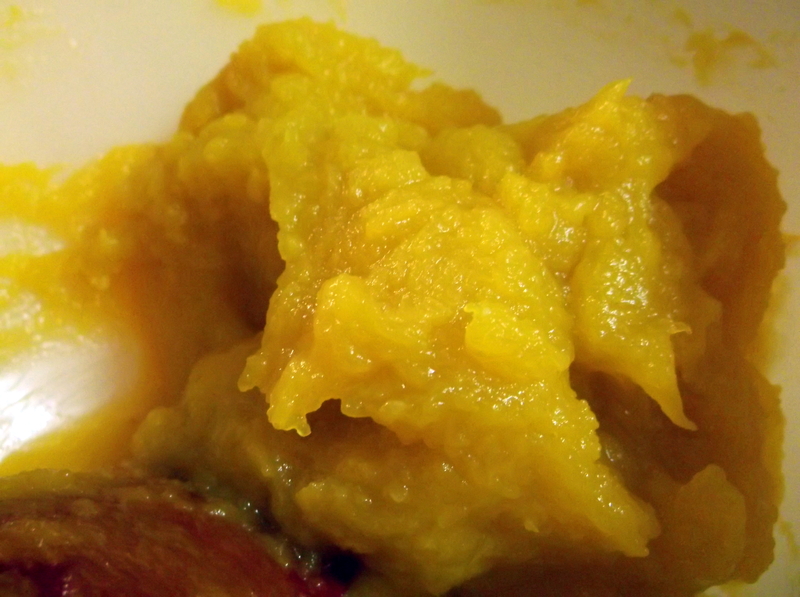 And I didn’t want to waste all that delicious pumpkin, so I pureed it! 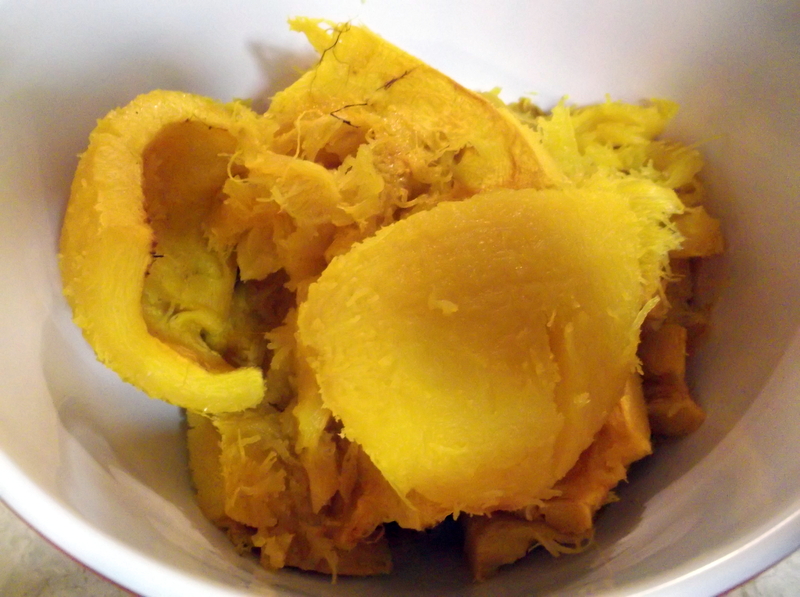 It’s very easy and tastes sooo much better than canned puree. Preheat your oven to 350 degrees. 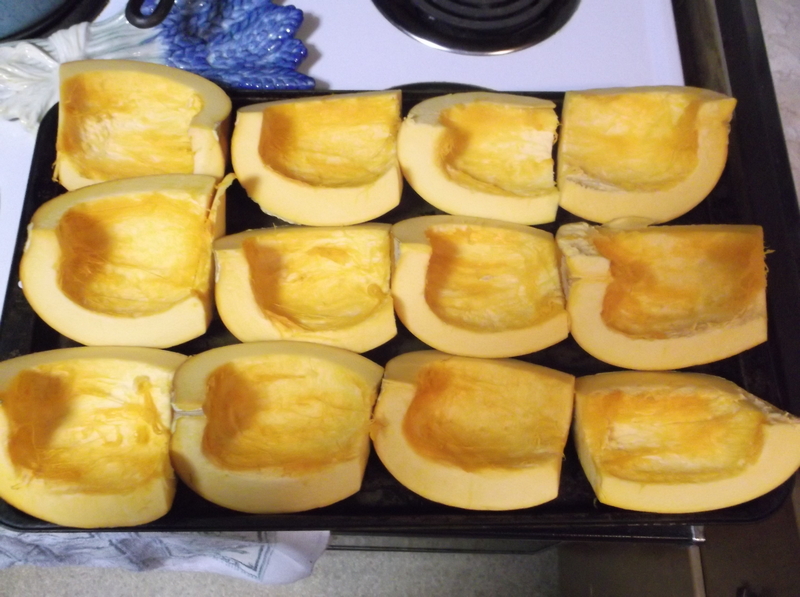 Line your pumpkin bits flesh side up on cookie sheets and cook for 45 minutes or until fork tender. 45 minutes later, they’re done. Now let them cool. Now it’s time to separate the flesh from the skin. 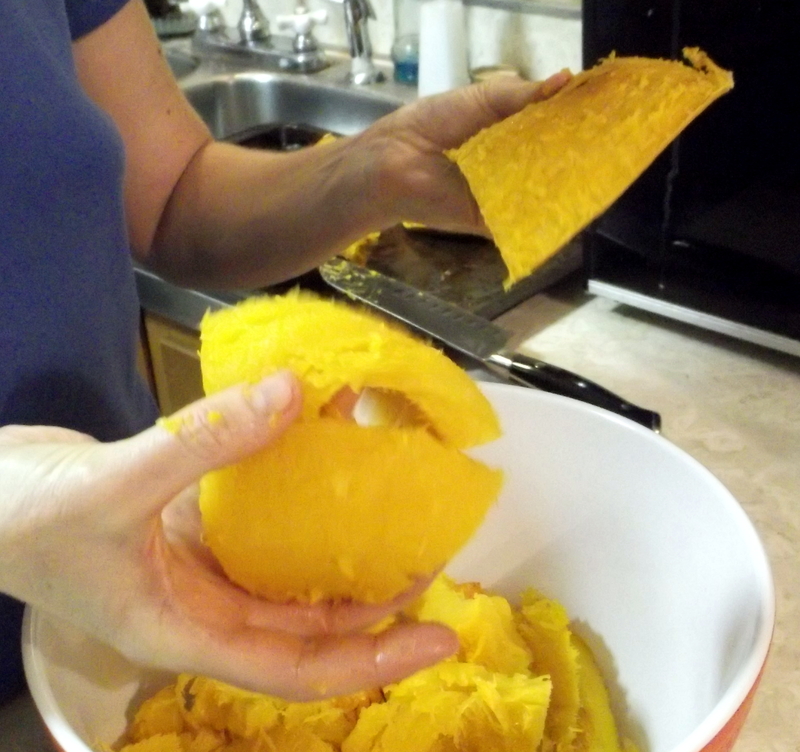 If, like me, you’re pumpkins are older, you will be able to just peel them. 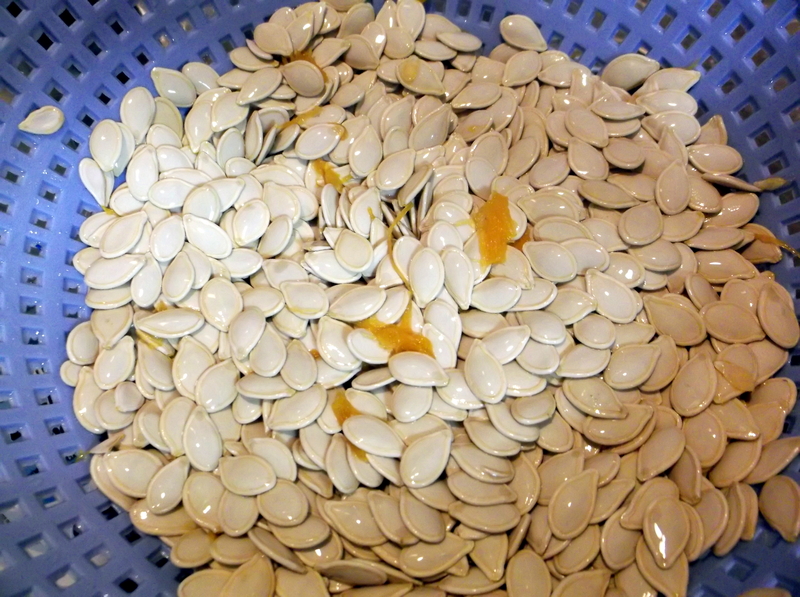 If they’re fresh pumpkins, they will still have a lot of moisture in them and might not peel easily. 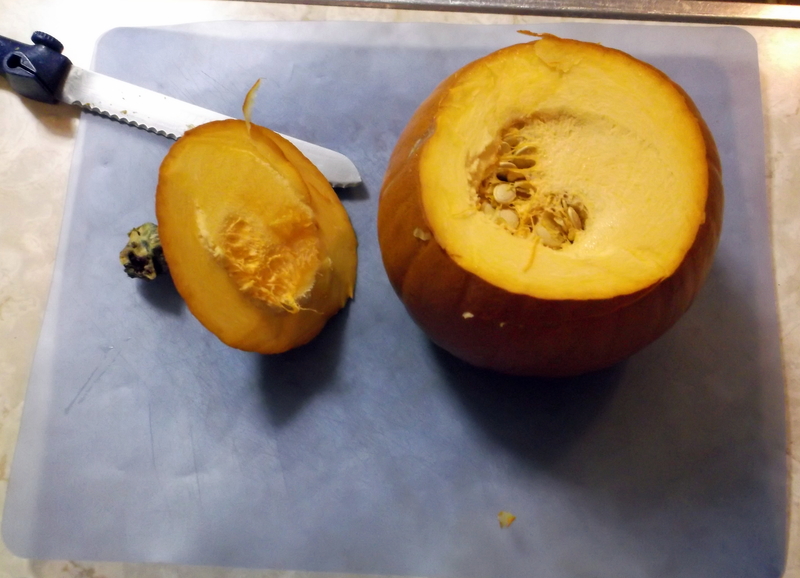 If so, you will have to use a spoon or a knife to scrape the pumpkin from the skin. 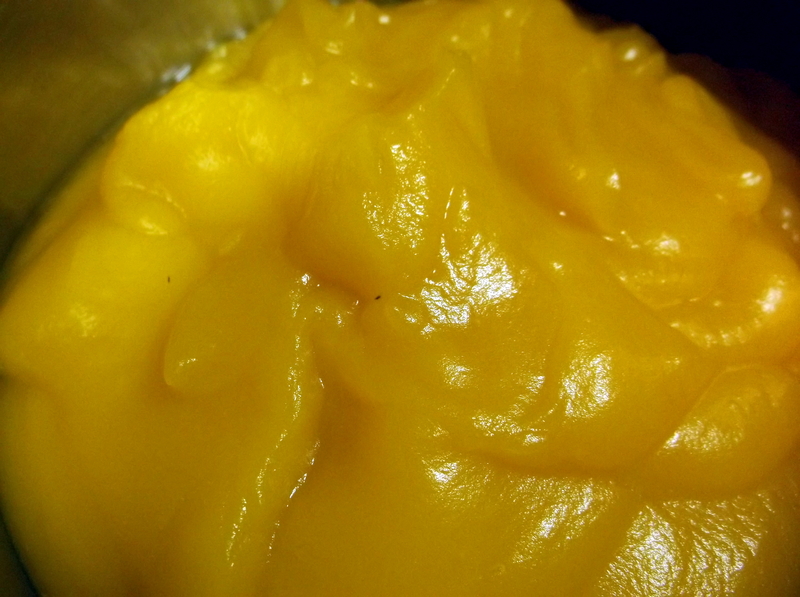 Using a mixer will give you more of an applesauce texture to the pumpkin. You’ll never notice it in muffins, but a pie will have a somewhat thicker rather than creamier texture. The same with pumpkin butter. Which is fine by me, BUT if you have family members that are sensitive to food texture then whip out your blender…. Now if your pumpkin is too dry to blend well, feel free to add some water or apple juice/cider to the blender to get things started. But only a little bit! 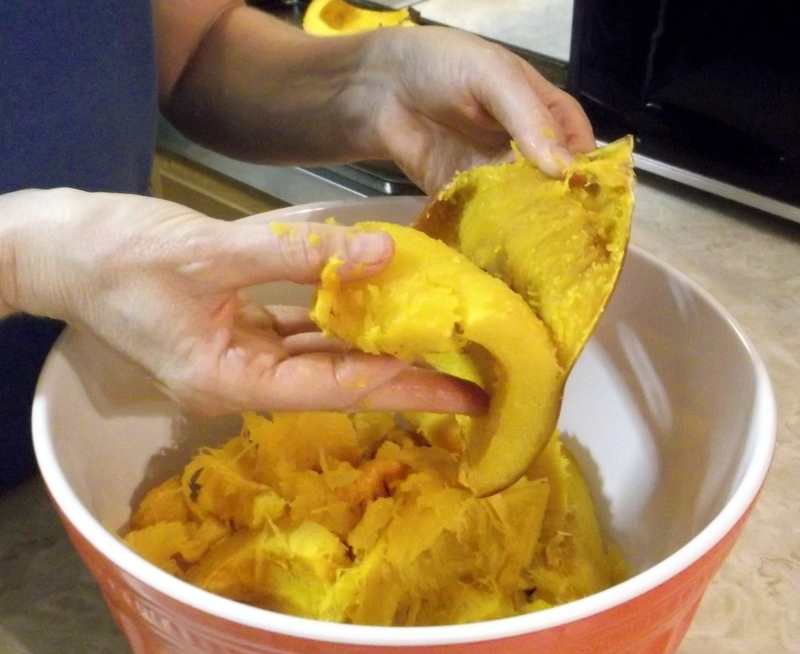 You don’t want watery pumpkin puree! And remember to blend in small batches for better consistency. 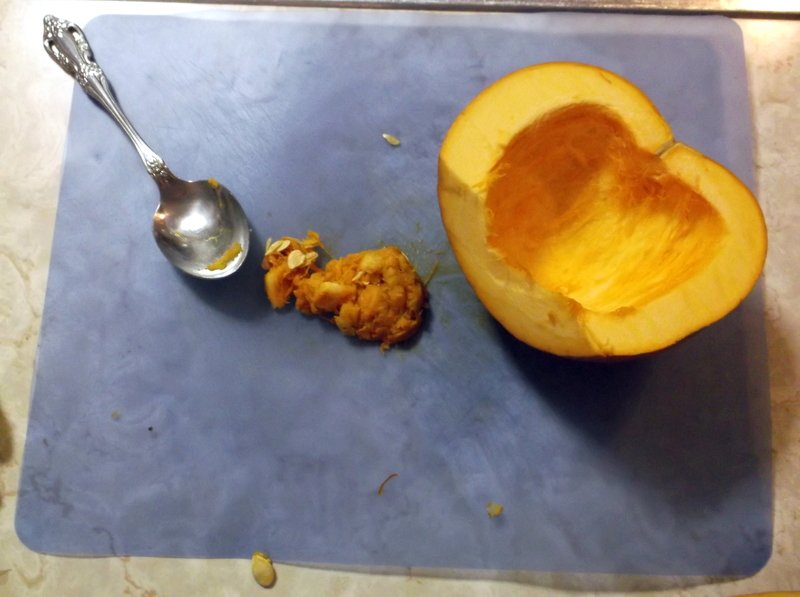 And for those of you with really fresh or less cured pumpkins that DO have watery pumpkin puree, pour your puree into a cheesecloth or flour towel lined colander and let it sit and drain for a couple of hours. If you have a large, fine mesh strainer, that will work as well. Some pumpkin will squeeze out, but not much. Now freeze it however you will in freezer containers or freezer bags. To make life easier on yourself, freeze it in cup amounts that match what you’ll use it for. For example, I have a cranberry pumpkin muffin recipe I love that requires 2 cups of puree. So I put two cups in a bag and freeze it. The night before I want to use it I put it in the fridge to thaw. But you could nuke it in the microwave on defrost in a pinch. Just be careful not to burn it! The puree will keep up to six months in a regular freezer. But if you have access to a freezer chest and a FoodSaver, it’ll go a year easy. Enjoy! Time to get back to regular life. I have been surprised at how difficult it has been to do things I enjoy. So a simple post to help get things rolling again. Yes! 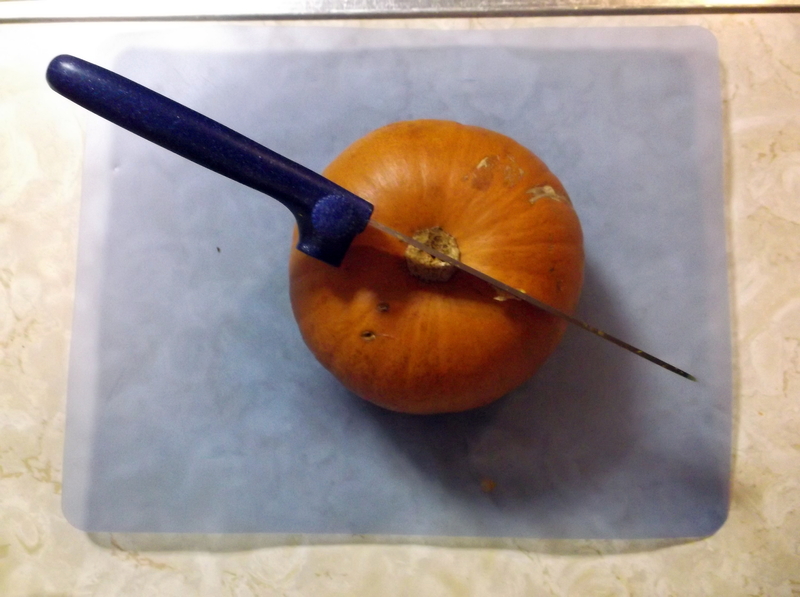 I said cooking pumpkin! (My local farmer’s market is selling them for a dollar each.) 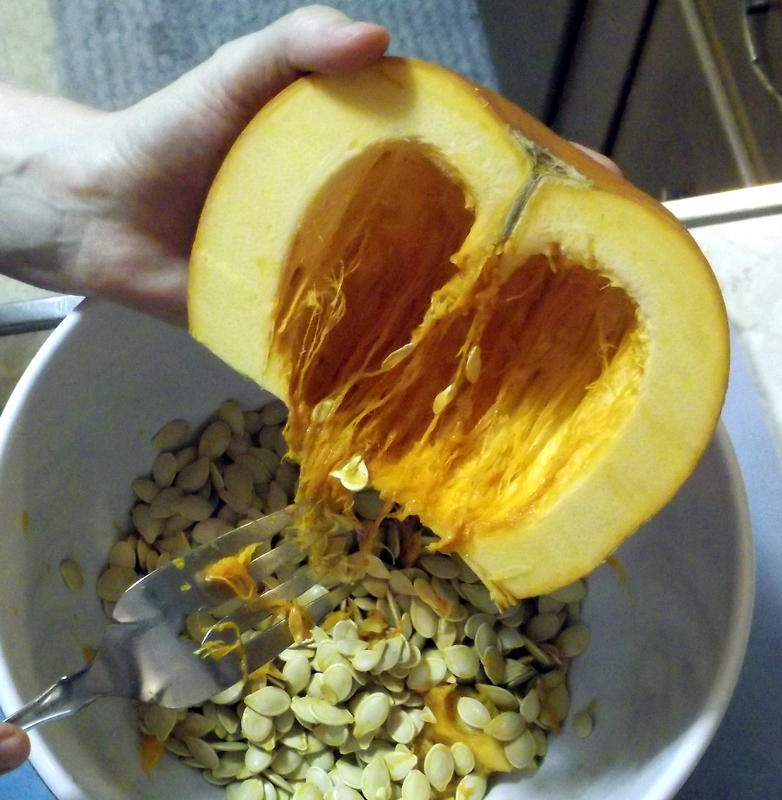 I don’t know if you could do the following with a Halloween pumpkin unless it was big enough to get your hand and the fork inside. Yup, fork! Besides the obvious, a knife, you need a salad type fork and spoon. If you have a salad serving pair, that works even better. Cut the head off your pumpkin. Flip the pumpkin over and cut it in half. 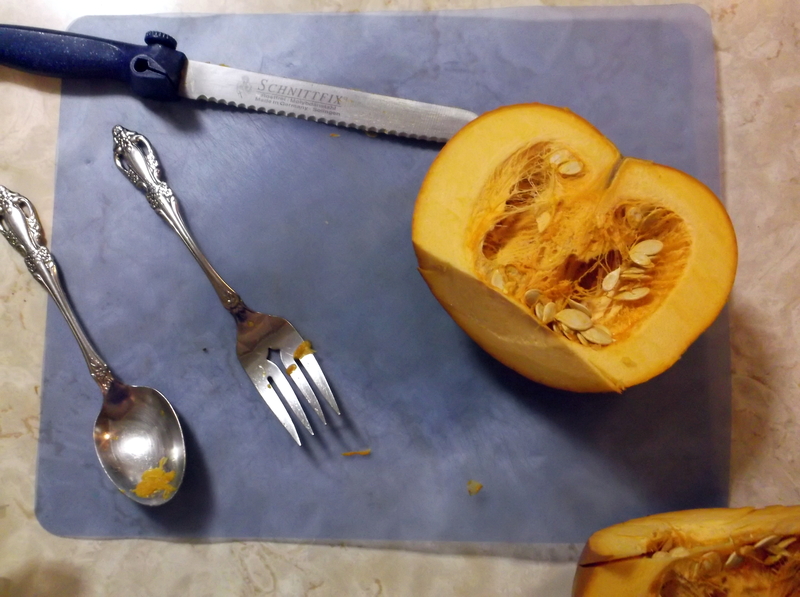 Once you’re through the blossom spot you can usually wiggle the knife and pop the pumpkin in half. Drag the fork through the seeds. They will start falling out with very little effort. You will leave behind nearly all the stringy stuff that is so hard to wash off. This is what is will look like when you’re done. Scrape out the stringy stuff. Now you get to use your imaginations! You know, make a picture in your head! Fill the bowl full of seeds with water and stir. The water will be orange, the seeds will float, and any chunky stuff will sink to the bottom of the bowl. 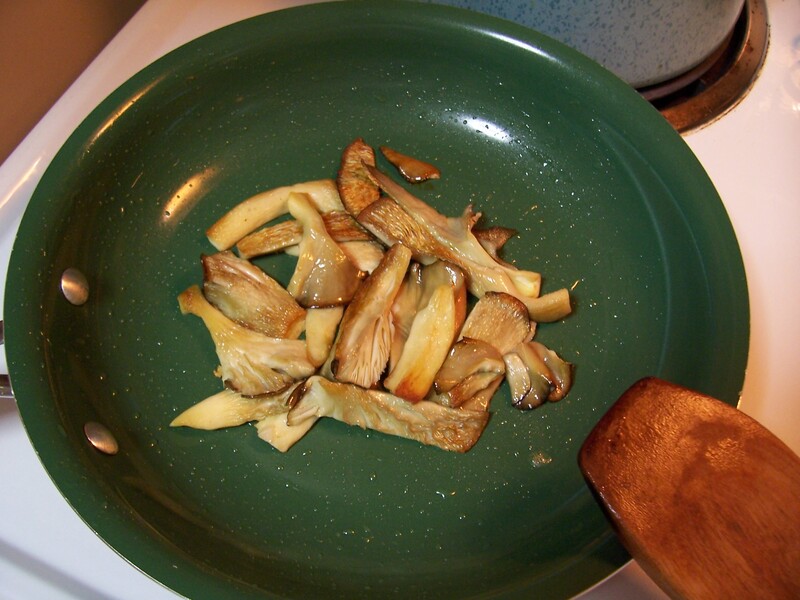 Reach in there and scoop out the stuff on the bottom and dump the seeds into a colander for a final rinse. There may or may not be a couple of orange bits still stuck to the seeds. Your choice to remove them or not. I took out those two pieces in the middle and ran the seeds under the faucet. Now choose a drying method! 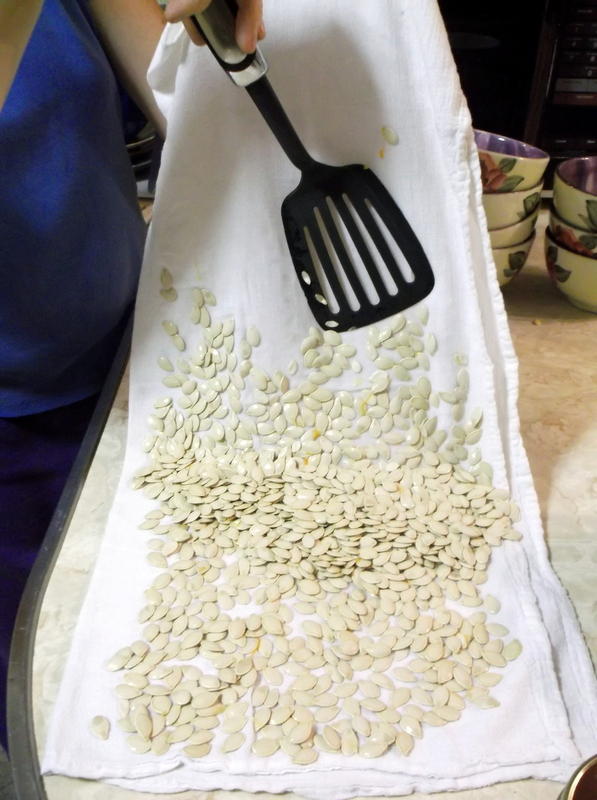 Paper towels or real towels and dump the seeds out to pat them dry. I like to dry mine on flour towels. A spatula will take care of those sticky ones! 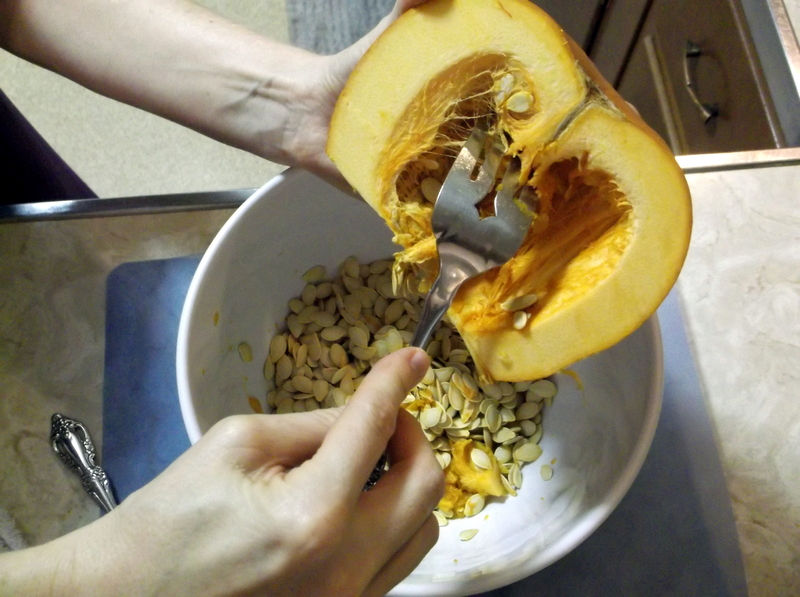 Now pick your favorite pumpkin seed recipe, cook those seeds and enjoy! 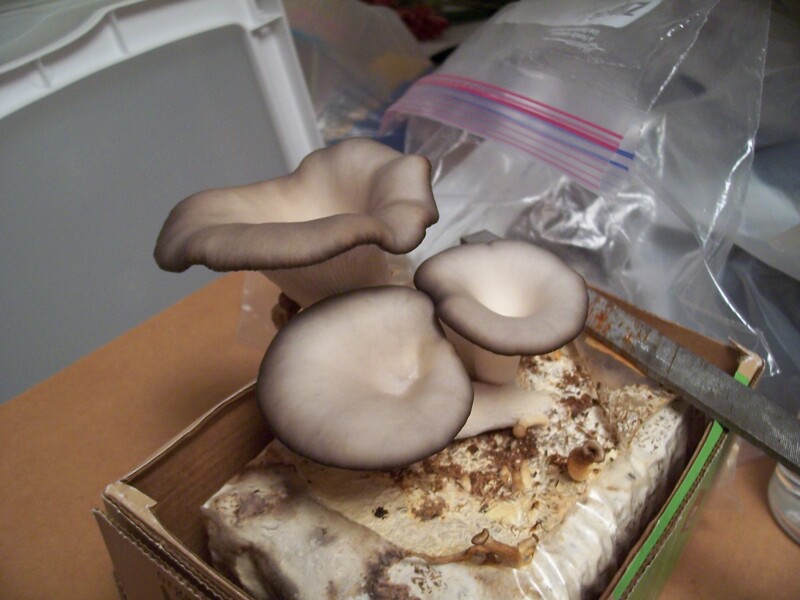 After we harvested the crop of mushrooms in March, I put the kit in a back room with a ziplock bag dropped on top to hold in moisture. I had fully intended to deliberately go for another crop. Life went to hell and I forgot all about it. A couple of weeks ago back in May, I was rooting around in the room where I had put the mushroom kit and noticed the ziplock bag was tented somewhat. 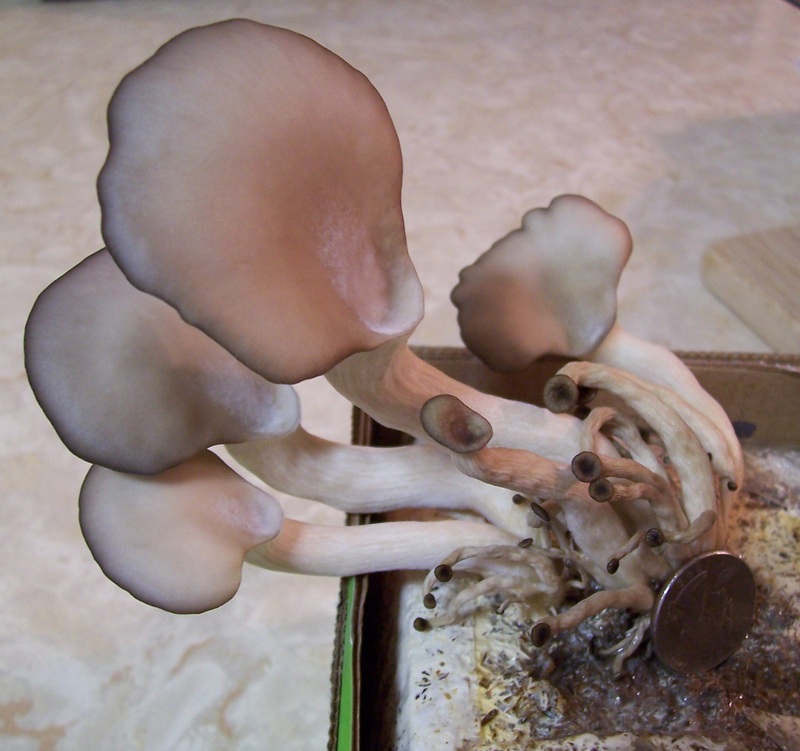 I lifted it and found a second crop of mushrooms had tried to grow without any help at all from me. 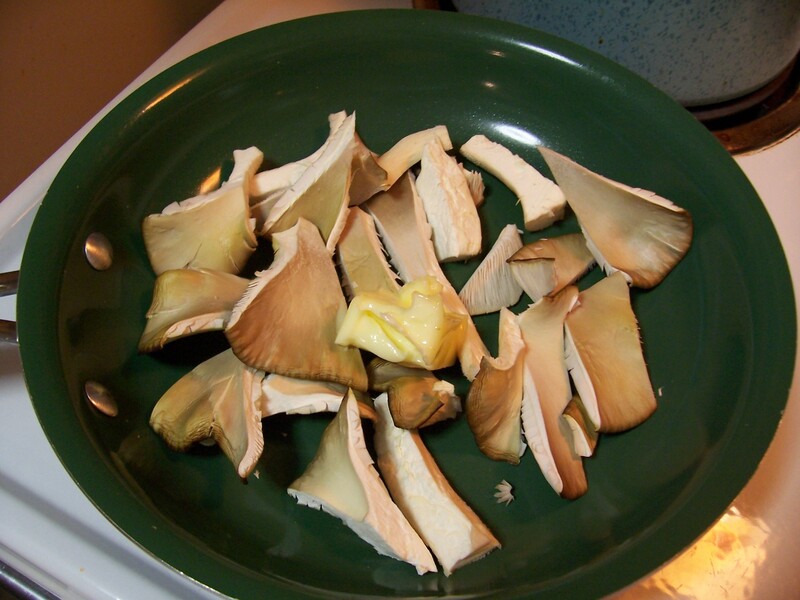 Because of the ziplock bag the carbon dioxide levels were too high and half the mushrooms were dead already. The others I sprayed down with water, shrugged my shoulders because they were so sad, and walked away. Two days later I was smiling. Aren’t they beautiful? Can you see the little dead ones? So sad. 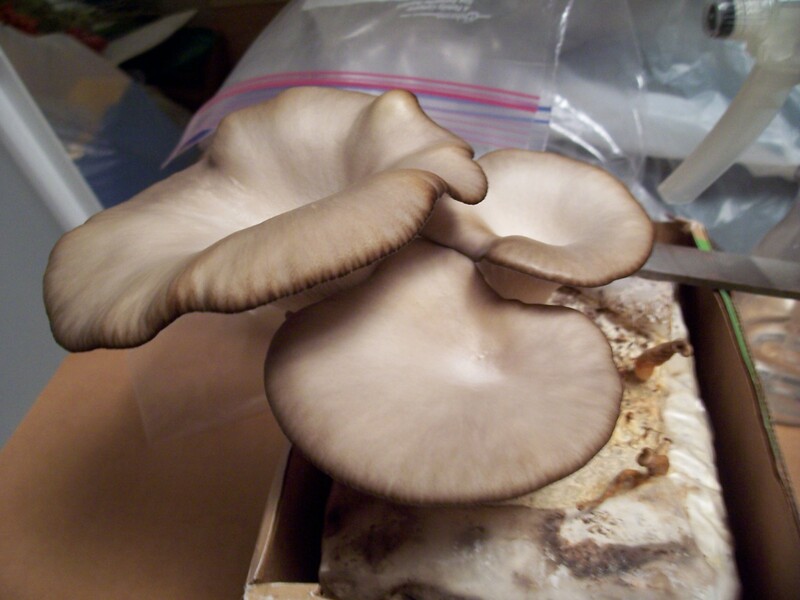 But the live ones were twice the size of the first crop. And then it was time to pick them. 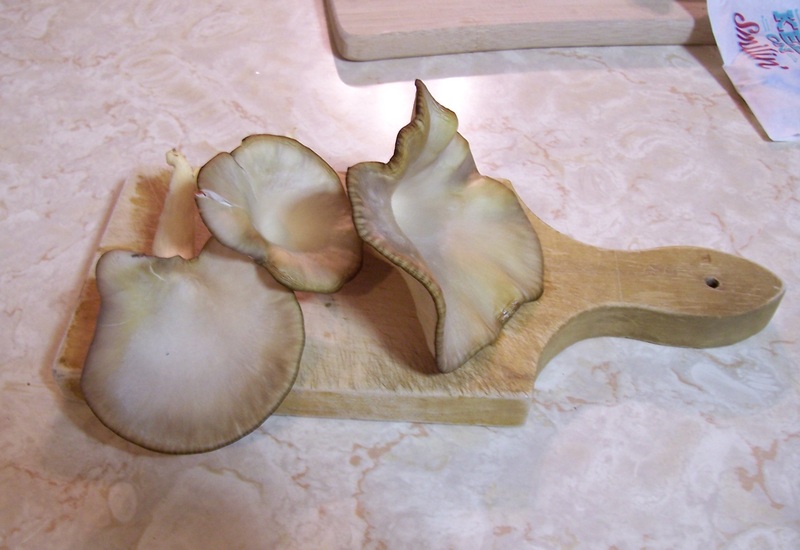 So I sliced them and sautéed them with some butter and a dash of sea salt. Time to eat them. Mmm, Mmm good!!! Today. One day too late. See how they’re shriveling up? Gonna cook them anyway! Pulled the clump and cut off the bottom. 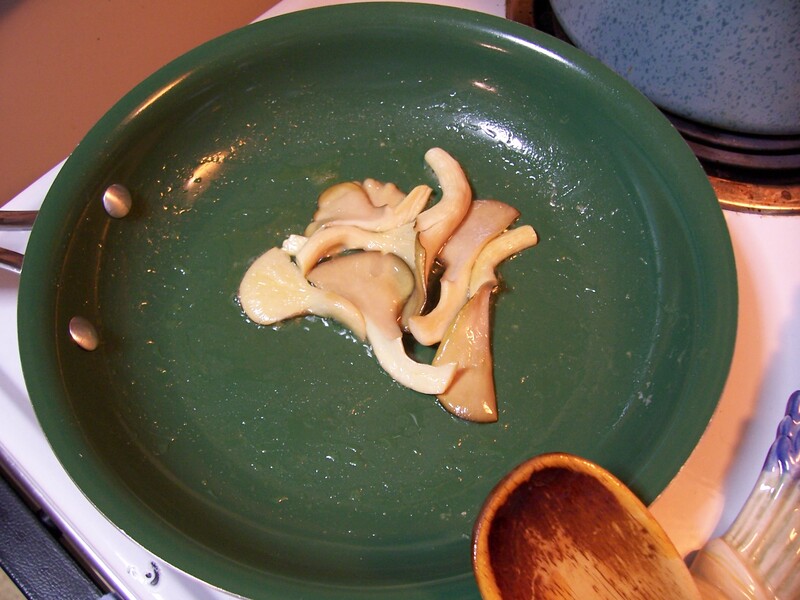 That left the four mushrooms you see in the picture. 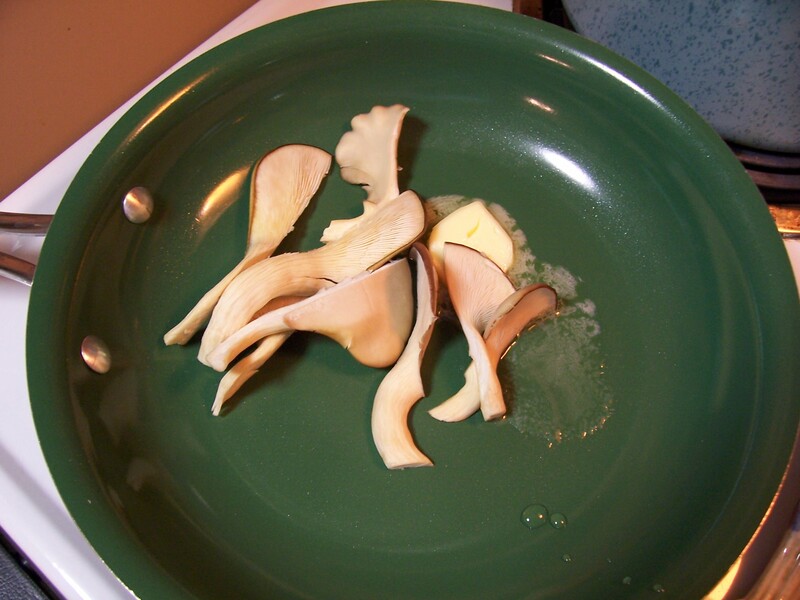 I cut them in half down the middle, tossed them and a pat of butter in the pan on medium heat. I sautéed them for about 8 minutes. Mmmm, smells good! A dash of sea salt and they’re ready to eat. And they still tasted really good! A slight nutty flavor. Definitely would be interested in eating more of these! 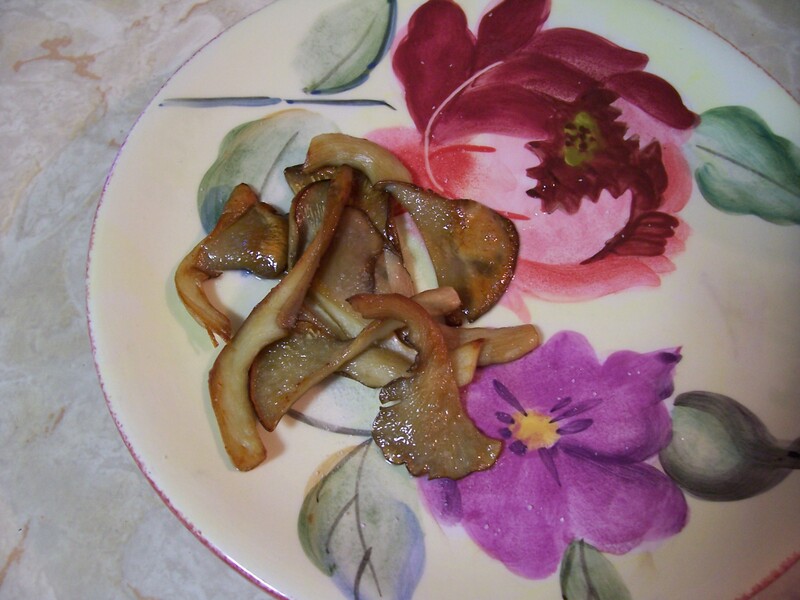 Unfortunately, at $10 for the kit, that was an expensive 2 mouthfuls of mushroom. Though I thoroughly enjoyed growing them. So I guess you pay for the fun, too. I would still recommend this kit. Especially if you enjoy learning new things and/or you have children. 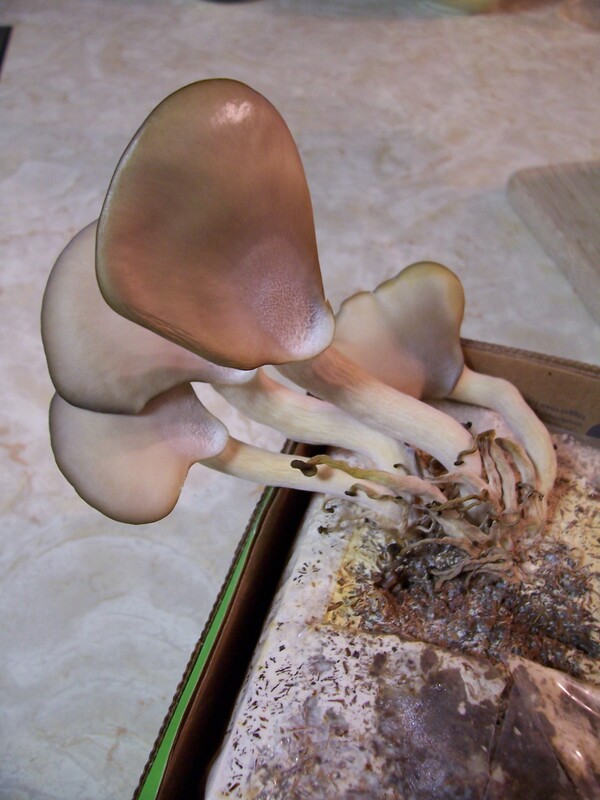 I now better understand how those mushrooms can just pop up out of nowhere in your yard. These things grow fast! Also, in running around the web, I found out different ways I can encourage a second crop. So, in a few days I’ll take the time to reset this and see what happens. I’m looking forward to the possibilities! Sooo, these may be ready to eat. 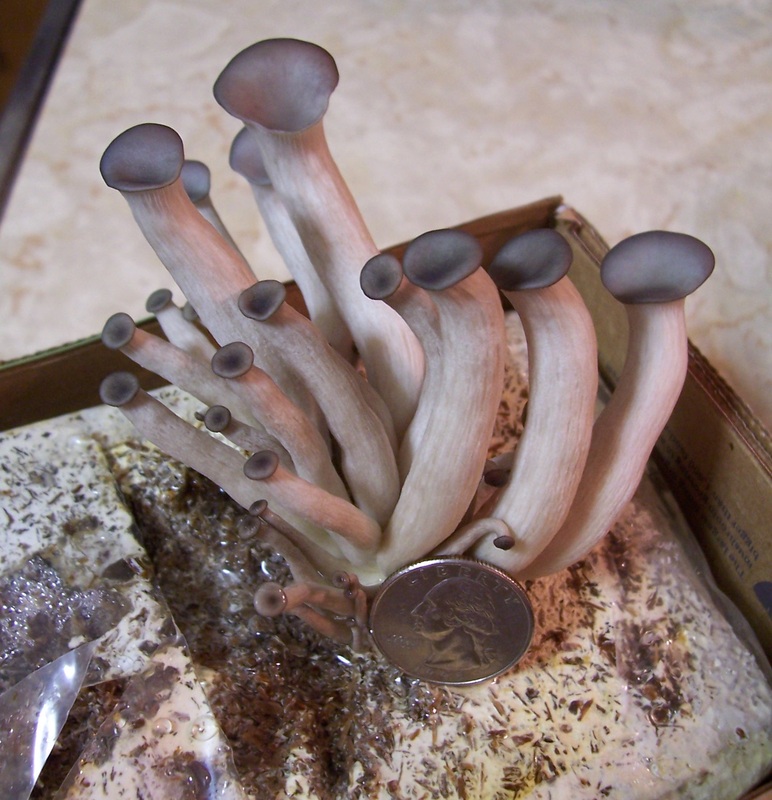 They have a distinct brown edge and the little ‘shrooms are shriveling. I will check them tomorrow. If they haven’t grown significantly again, I will harvest them. 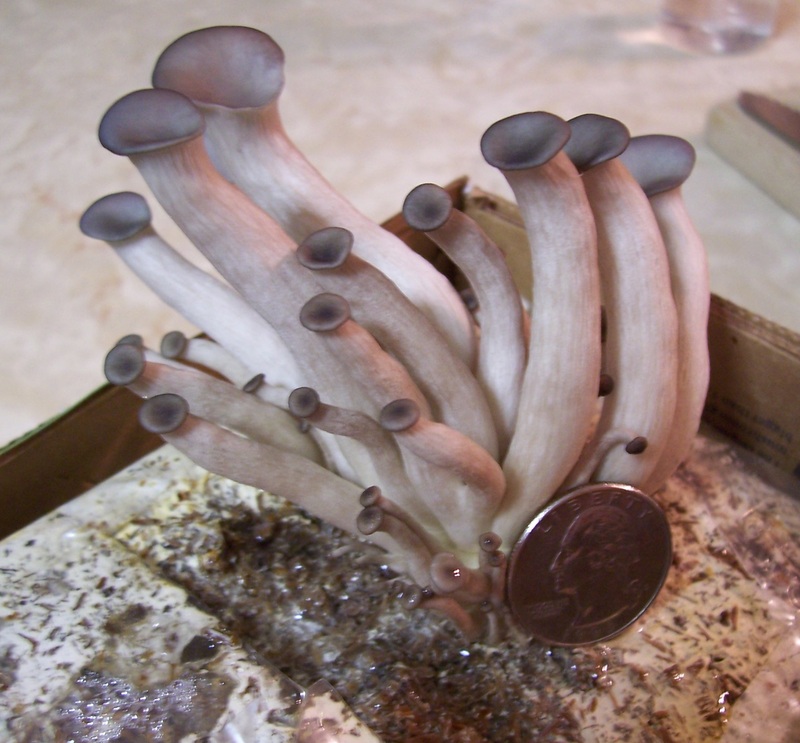 I was not happy with how these were growing and went scooting around the web for info. I may have screwed them up by keeping them tented, even though it was only a partial tent. 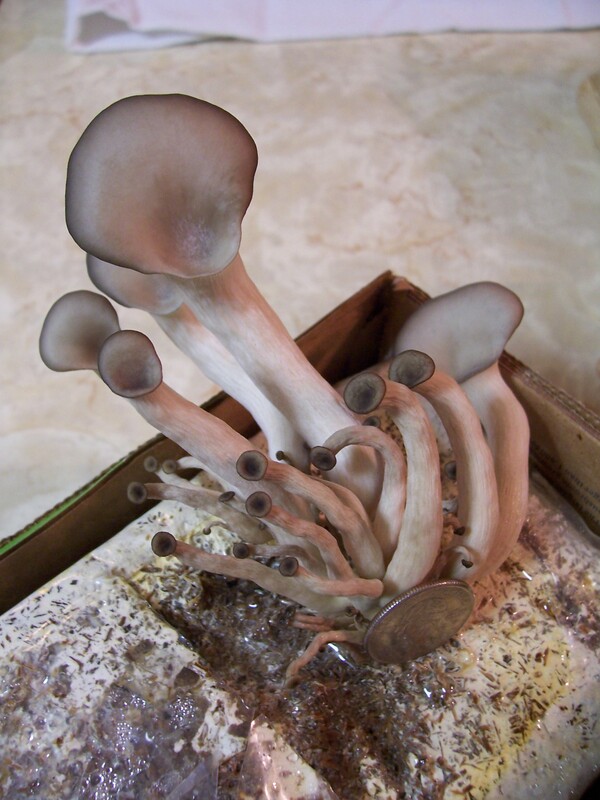 From what I’ve read, mushrooms need a lot of oxygen. 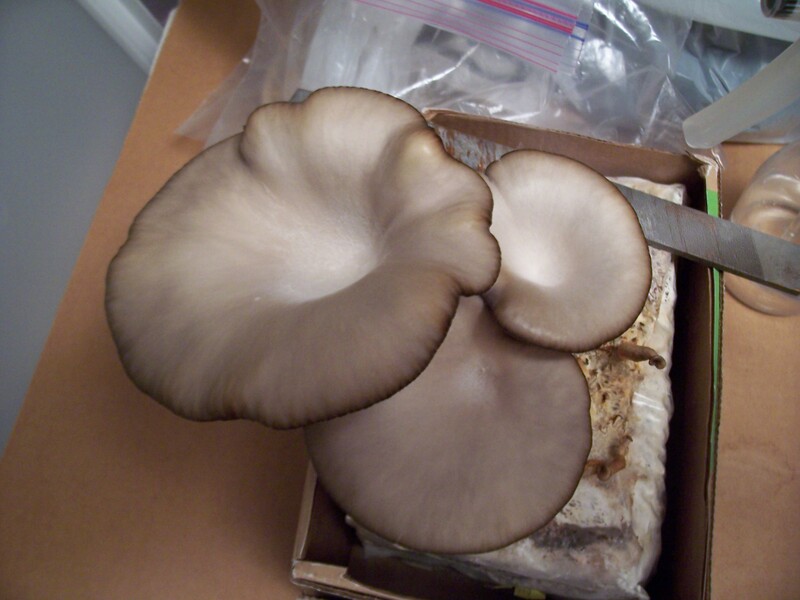 Carbon dioxide can mess with mushroom growth, and a partial tent would have messed with the exchange of gases. It would have been better to mist them 3 – 4 times a day. Live and learn. Speaking of which, I’ve read about some ways to promote a second growth, and, of course, I will give it a try! An irregular burst of growth. Some doubled and one even more than that while the others stayed virtually the same. ??? I hope the little ones don’t up and die on me! The growth ‘up’ wasn’t as dramatic, a third more. But a lot of the stems have gotten much thicker! A higher view. Oh! 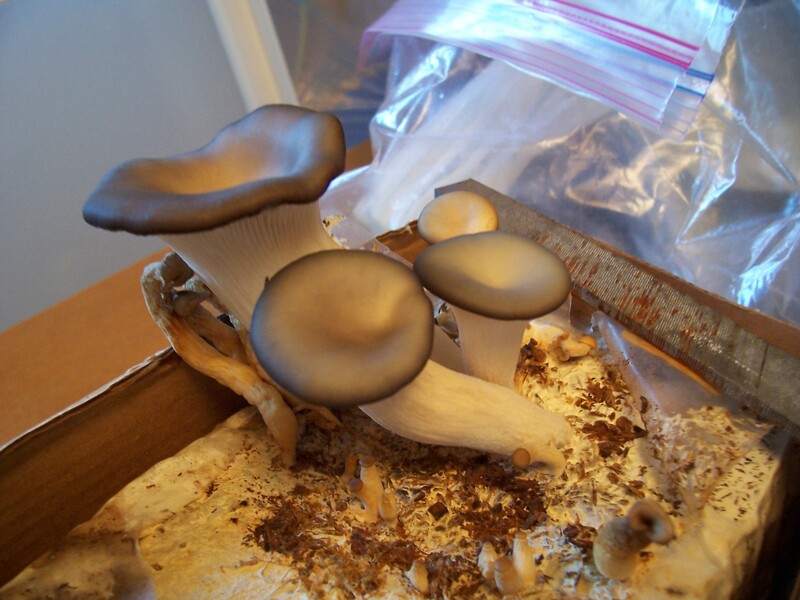 And they are starting to smell like mushrooms now!